San Marcos Plumbers offer Plumbing and Drain Cleaning Services in San Marcos, Ca / North County San Diego. Just give us a call and we’ll do our best to diagnose your problem and give you an estimate – free quote right over the phone, or at least a ballpark figure of what it should take to do the job. When you call San Marcos Plumbers during business hours, a plumber will actually answer the phone! not just any answering service or dispatch center telling you that they don’t know anything and can only send a technician out. Residential or commercial, San Marcos Plumbers will fix, repair, remove, replace, and install new plumbing fixtures, kitchen faucet, valves, risers, toilets, toilet fill & flush valves, shower valve cartridge, water supply lines, lavatory and kitchen sink basin installs, spigot, pop up, hose bib garbage disposal repair, replacement, dishwasher hook-up, and water pressure regulator installs, water heater, and leak detection services for concrete slab floor leaks as well as camera and drain location services. San Marcos Plumbers also provides rooter services and unclog all clogged sewer drains anytime, mainline, branch, floor drain sink mop sink, kitchen sink, bath tub, lavatory, shower or toilet by way of clean out and vent stack cabling, cable, snake snaking and hydro-jet – high pressure water cleaning to remove sludge in the lines. We work with traps, copper pipe, abs, pvc, corex, french, area, yard, pool and patio drains, we auger toilets. We are an rootx dealer for root killer product. we also offer camera and location services for your drains and a free consultation in San Diego County. San Marcos Plumbers know how hard it can be to find a friendly, honest and experienced plumber. It’s pot luck out there! There are a lot of plumbing companies to choose from. Don’t worry… Just give us a call and see if we’re the right one for you. 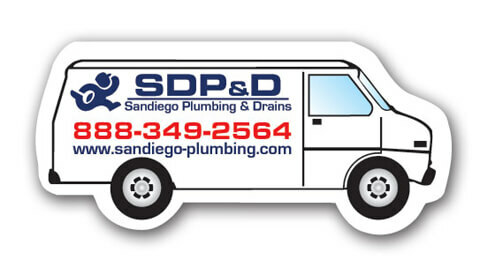 We have been in the Plumbing and Drain business since 2004 providing quality services to many thousands of satisfied customers in San Marcos and the San Diego County area. We are service technicians and only perform smaller jobs as listed above. We do not offer new construction, remodels, re-pipes, re-routs or repair concrete slab leaks. However, we can refer other companies to you.